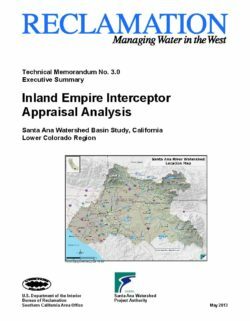 The Santa Ana Watershed Project Authority (SAWPA) is a joint powers authority comprised of five member water districts that serve the vast majority of the Santa Ana Watershed. The area served by SAWPA is located within Orange, Riverside and San Bernardino Counties of California, bounded by the Pacific Ocean on the west, the San Bernardino Mountains to the north, and the San Jacinto Mountains to the east. • Orange County Water District (OCWD). These five agencies serve most of the Santa Ana Watershed. Population within the watershed has increased significantly in recent years, and this urban growth has put enormous pressure on the regional water supply, water quality and environmental/recreation resources. SAWPA’s mission is to plan and build facilities to protect water quality and enhance the water supply within the Santa Ana River Watershed. This mission includes the goal of achieving a salt balance in the upper Santa Ana Watershed. SAWPA developed the Inland Empire Brine Line (Brine Line), which was formerly known as the Santa Ana Regional Interceptor (SARI), for the purpose of exporting salt from the Santa Ana Watershed. Exportation of salt prevents its accumulation in the watershed and protects the quality of the potable water supply. The future of the potable water supply will continue to be dependent upon an economical means of collection, treatment and disposal of brine. The Brine Line collects and disposes of brine flow from the Santa Ana Watershed and is critical to SAWPA’s mission success. The Brine Line includes approximately 72 miles of pipeline in multiple branches which converge in the vicinity of Prado Dam near the City of Corona. It has a planned capacity of approximately 32.5 million gallons per day (MGD) and was planned for collection and exportation of approximately 271,000 tons of salt per year from the upper Santa Ana Watershed, east of the Santa Ana Mountains. Currently (2010 & 2011), average system flows are approximately 11.7 MGD and over 75,000 tons of salt are exported per year. An additional 21 miles of pipeline convey the combined flows to Orange County Sanitation District (OCSD) facilities for treatment and disposal by discharge to the Pacific Ocean. This pipeline has a nominal capacity of 30 MGD. The planned capacity of the Brine Line system (32.5 MGD) exceeds the hydraulic capacity of the pipeline from the Brine Line convergence near Prado Dam to the OCSD facilities. Furthermore, the present agreement between SAWPA and OCSD allows Brine Line flows to the OCSD system up to only 17.0 MGD, with a contractual right to purchase up to 30.0 MGD capacity.